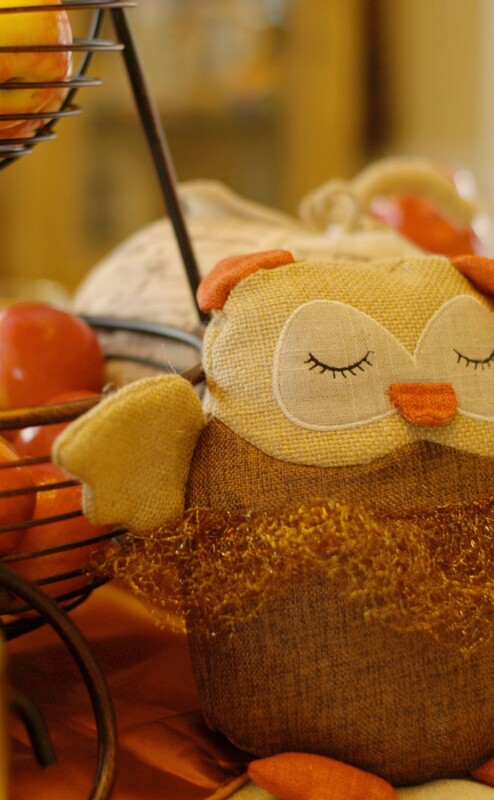 The quiet days of fall have finally arrived. My very favorite season, the one full of lovely colors, rich aroma that fills my home and a peaceful feeling that quietly takes over. As I noticed the first leaves beginning to fall, I knew it was time to redecorate and bring some of that lovely feel into my home. 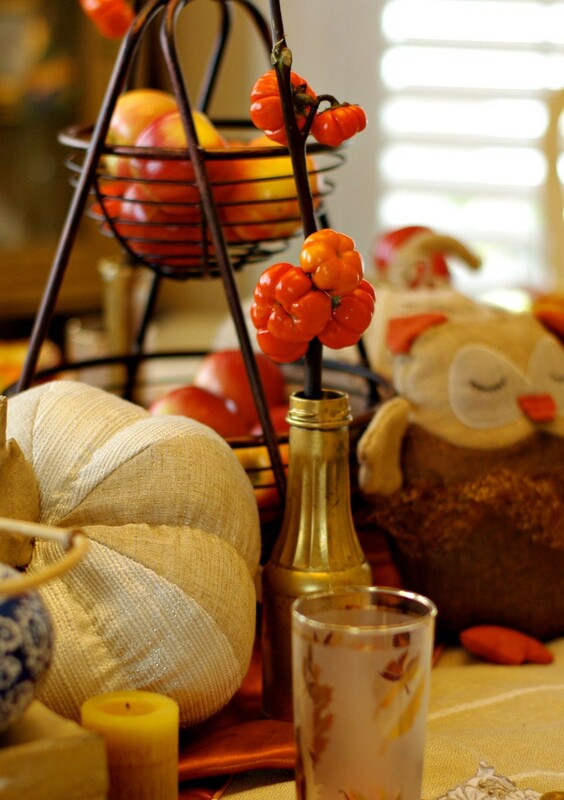 This season always brings a new kind of celebration, a time to refresh, a time to relax and a time to reminisce. 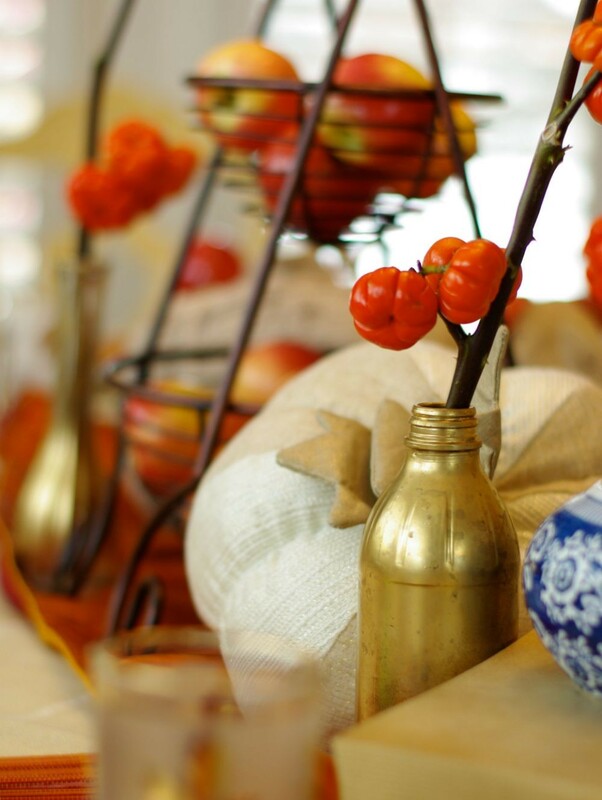 It’s a time to layer with color and textures and a time to enjoy some fresh produce from the summer harvest. 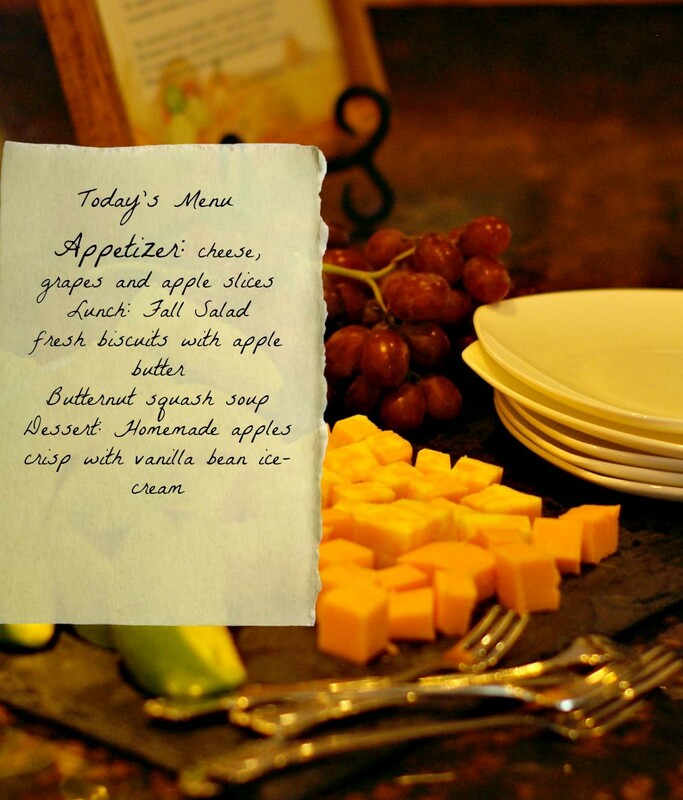 And what better way to bring this all together than to celebrate with some friends with a fall luncheon. 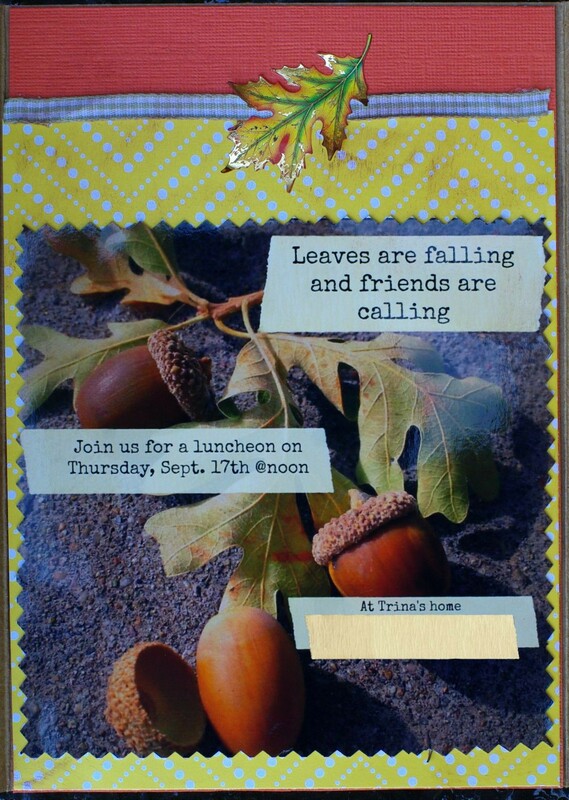 I created a little invite using a photo I took of a fallen acorn and then layered on some texture with background paper, ribbons and leaves. 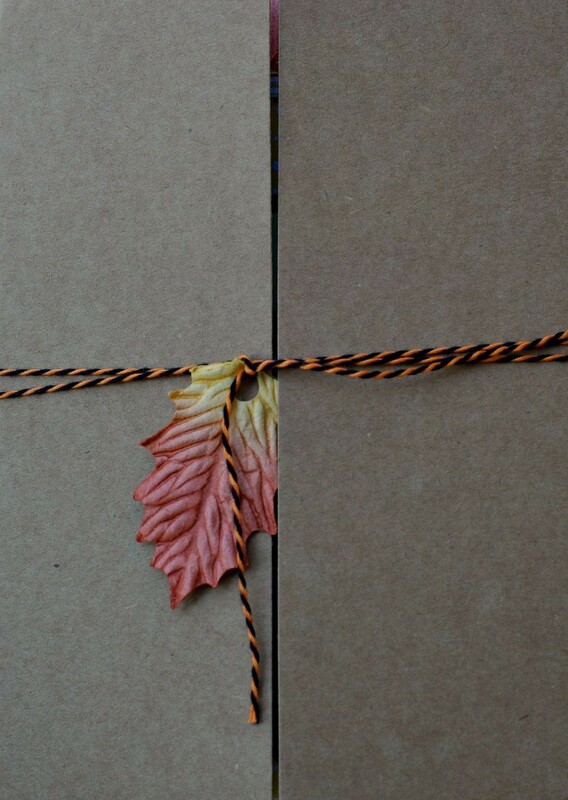 Then I placed them inside this three fold card, tied it up with some bakers twine and another leaf and off they went. I invited some new friends that are Utah based fellow bloggers, it’s so wonderful what this blogging network can bring. I decided I would stick with fall leaves and apples as a theme. 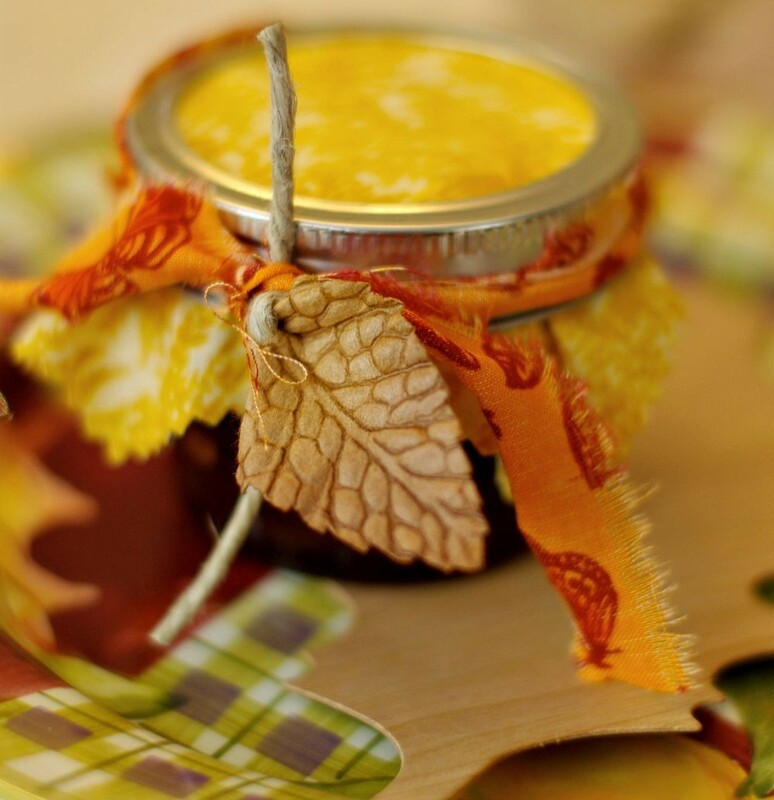 A few nights before I made a huge batch of homemade apple butter which I then poured into individual canning jars and tied them up with fall fabric and bows. 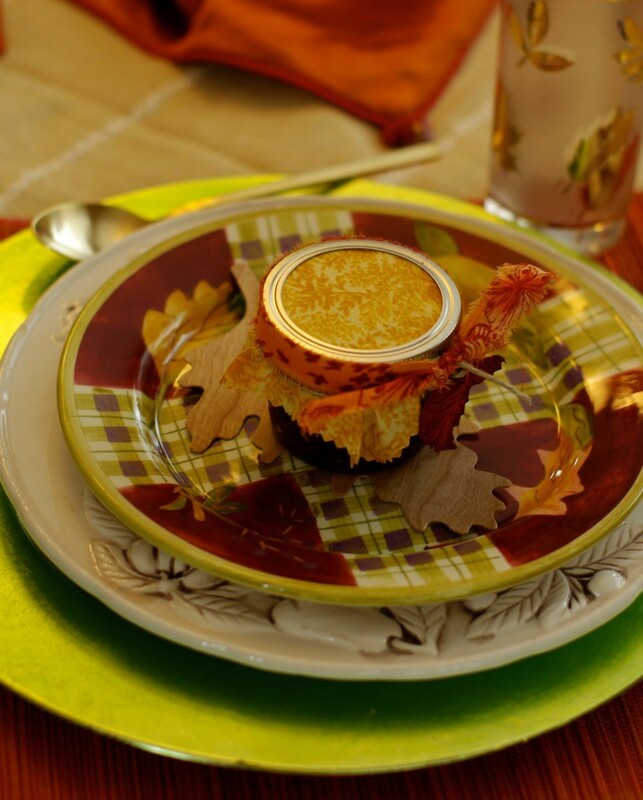 They were the perfect little item to top off each place setting. I’ve kept the table quite simple . . . Bringing in fall colors of green,gold, orange, and red . . . Different textures with silks, linen, and burlap . 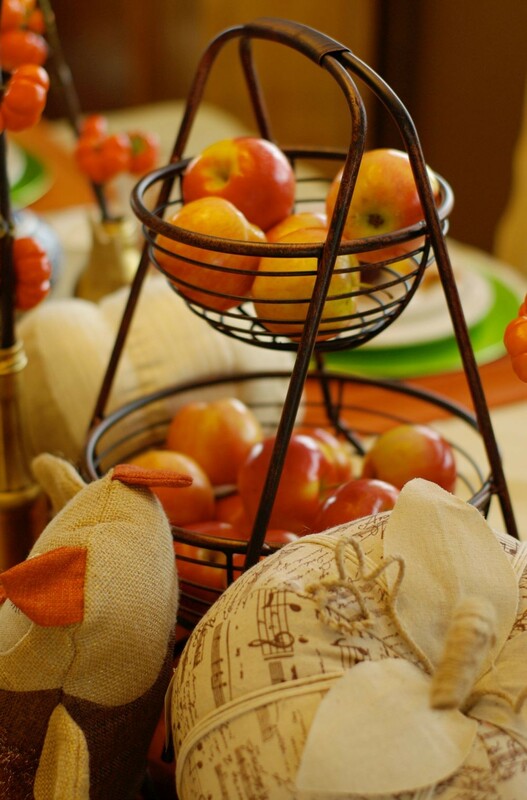 . .
And the centerpiece was full of nature- fresh picked apples and twigs from a pumpkin vine. 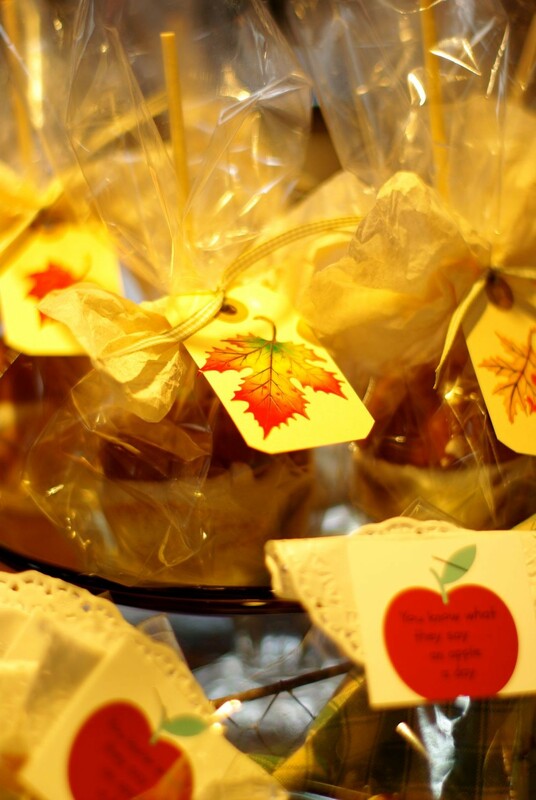 Each guest left with their apple butter jars as well as an apple sugar cookie (created the little tag, layered over a little doily) and homemade carmel apples. This is what a chose to serve for the day . . . 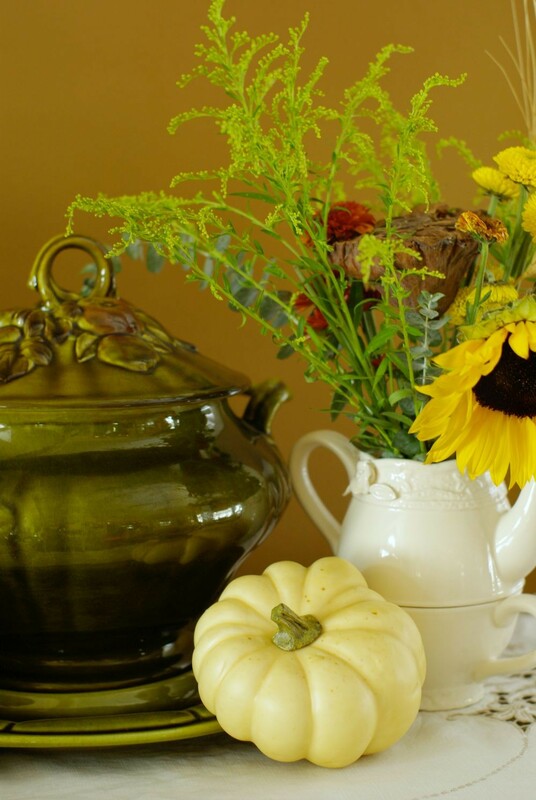 Throughout my home I added little fall vignettes . 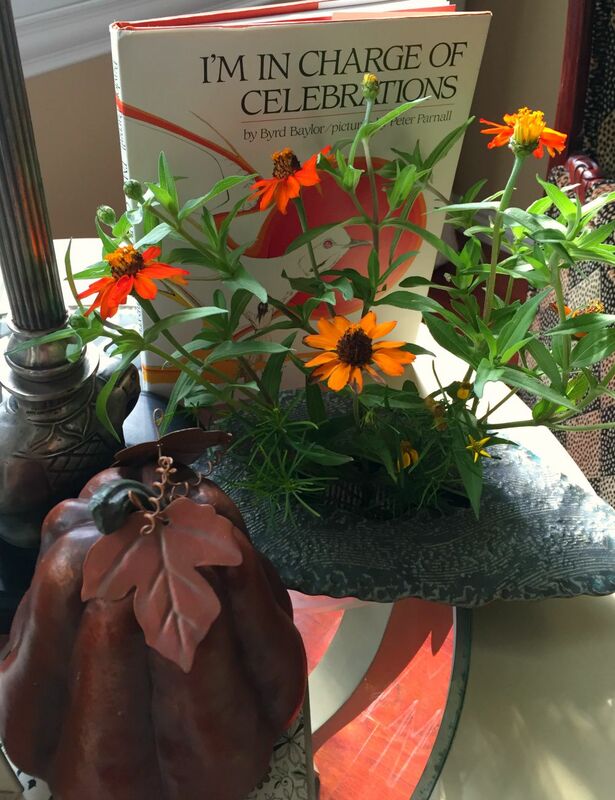 . .
Books and flowers from my yard . . .
Each of my cute friends walked in with the most adorable hostess gifts, which was so unexpected, but I was thrilled to say the least. 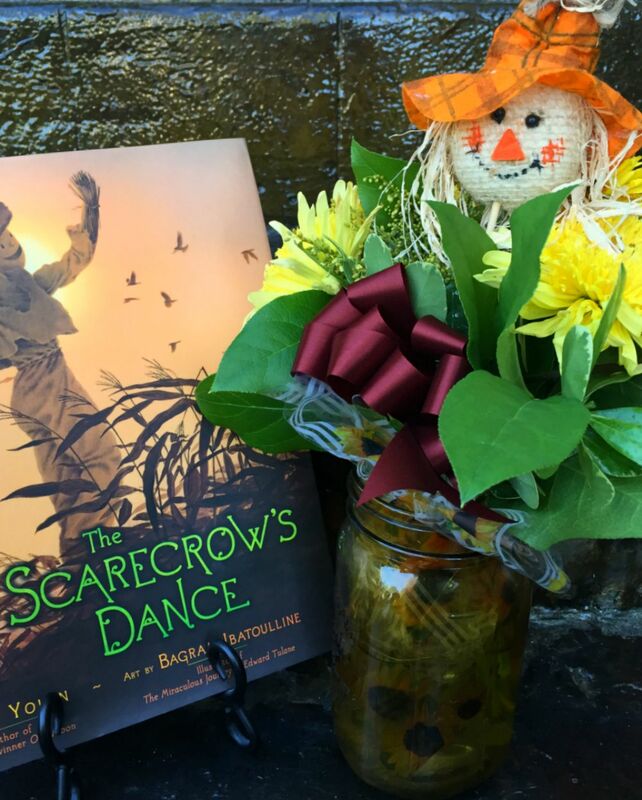 I’ll be featuring each of them in some of my fall posts but this little vase and flower arrangement from Jo (annnesattic-design.com) fit right at home with my scarecrow book I had out that I couldn’t leave without sharing it. Thank you my friends for dropping by today and welcome to the first day of Autumn! 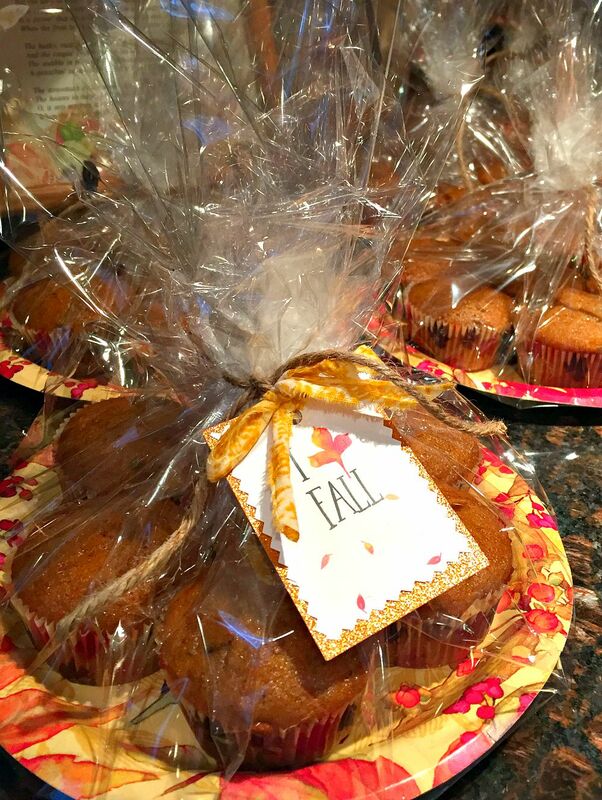 Yes, I’m sticking to my autumn tradition and baked up a storm of fresh pumpkin chocolate chip muffins, so I best running to deliver now. Hugs to you all . . .
Trina, have you ever written a book? Your “simple” table is my “over-the-top, let’s-take-her-temperature and see-how-she-is-in-24-hours” table. Haha. Fork, knife, spoon if you’re lucky, at my house, or two sticks (chopsticks, heh). Gorgeous, gorgeous. What a lucky bunch of women to share this spendid lunch with you. No Melanie, I’m too afraid if I actually wrote that book I just may be handed your distinguished “Cleaning Glove” award and I would feel absolutely terrible taking it from you (hahahah). Seriously some day you and Greetje need to come for a tea party and you would see how down to earth I actually make them, or how relaxing and fun they can be. I’m designing my invites for the annual “witches tea” and you would have a blast, should I book your ticket? I agree with Melanie. What is just fun and normal for you, is gobsmacking for us, mere mortals. Fantastic table again. I can understand why fall is your favourite season. The colours are so rich. Unfortunately in The Netherlands there is far too much rain in this season. So spring is my season. Tender green and hope for sunshine. You and Melanie make me laugh, but actually a lot of my close friends around here think just like the two of you. Isn’t it a good thing we all have our own unique likes and talents? 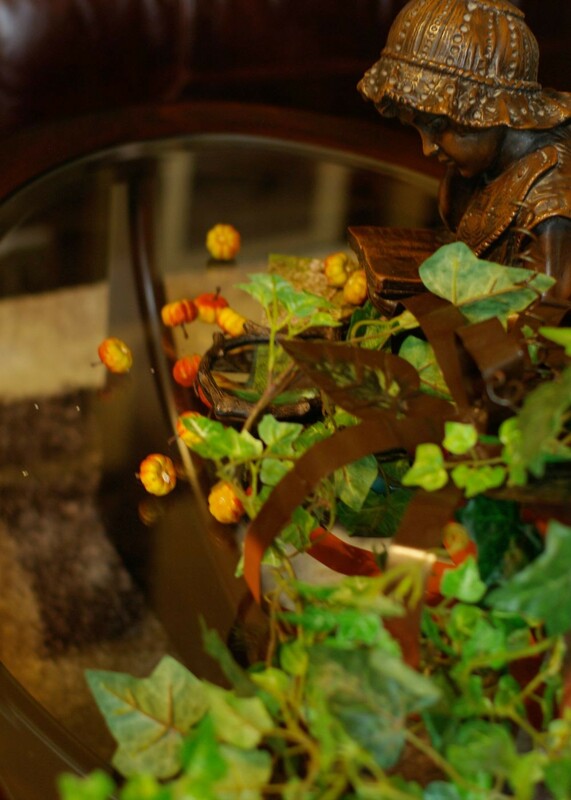 By the way, did you recognize the vase by the book? I’m quite loving that unique piece, I seriously can run outside and cut any type of plant and stick it in and it looks wonderful. Everything was so well thought out and yet simply charming. What a delightful way to spend the afternoon! Thanks -Paula. It truly was a delightful afternoon and made even more so by your company. Looking forward to meeting up again. Another beautiful get together Trina. Those muffins sounds so heavenly! Oh Alice, I will confess, the muffins are to die for! And they make my home smell wonderful. Thank you for coming Jo, and for the lovely arrangement, doesn’t it just fit perfectly next to one of my treasured books? So happy I decided to purchase that fun and unique piece of art. It makes displaying flowers so easy. 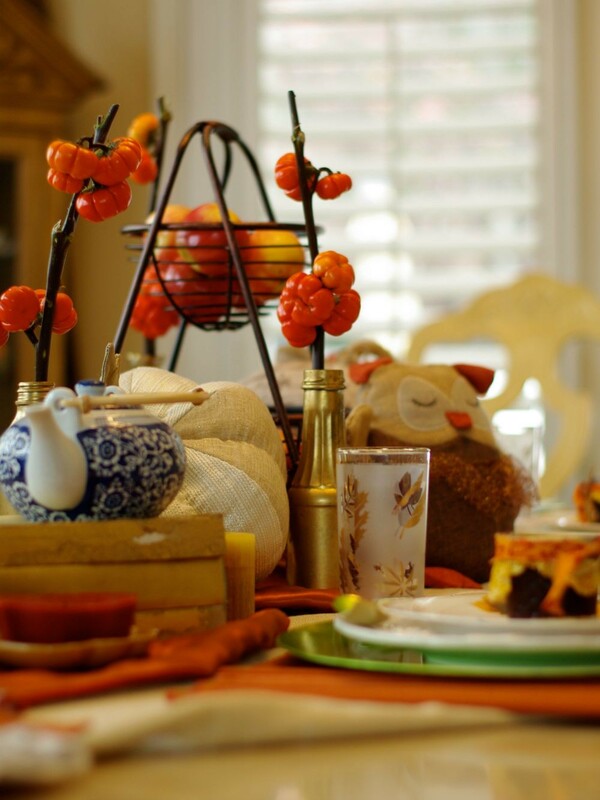 This is a beautiful post … and looks like you hosted a very special luncheon! Thanks for sharing. Thanks for dropping by Debbie. What lovely autumn post! Just as I would expect from you! Love the photo of the fallen acorn, how clever to use that!Something tells me that these new friends from Utah are going to be delighted ! It’s seriously so much fun meeting friends in person. Now the big question, when will the two of us meet up? 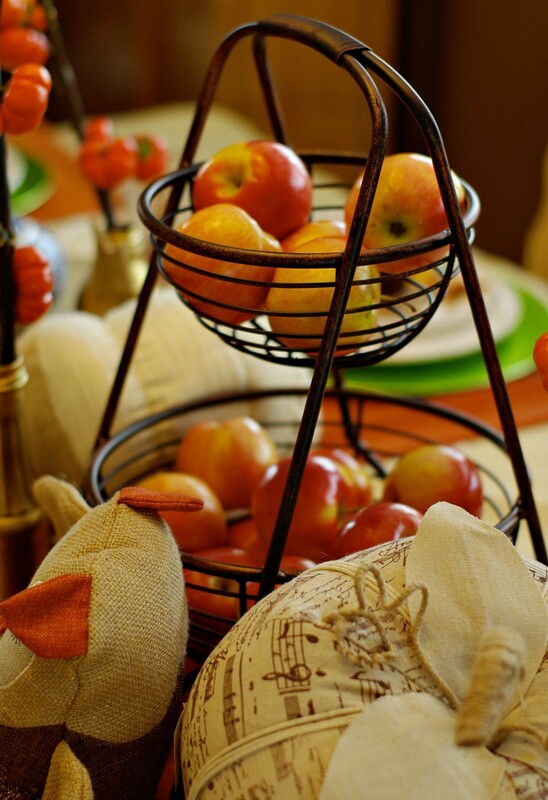 Trina, your home was absolutely gorgeous and I adored the leaves and apple theme. 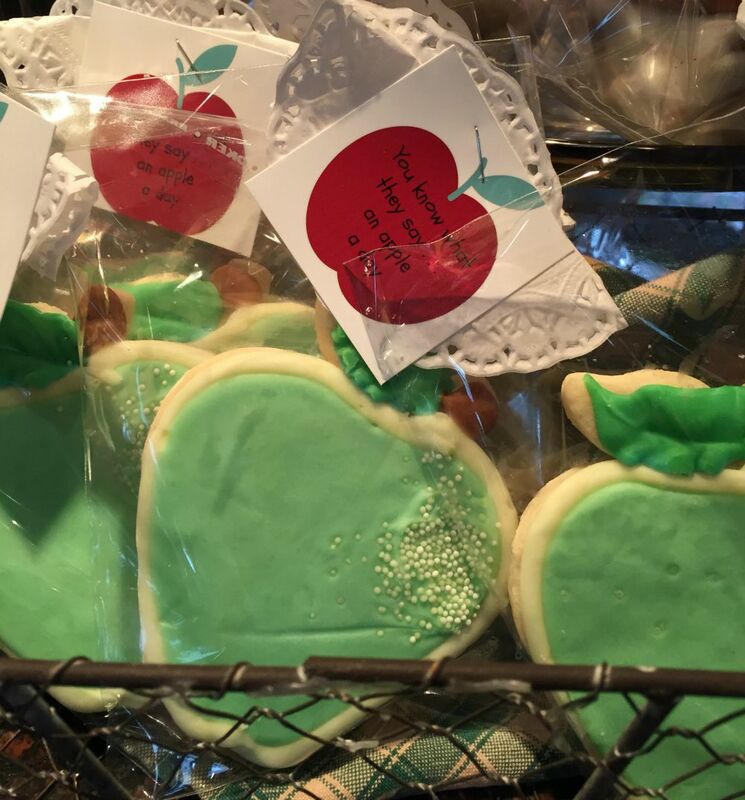 I must tell you I shared my cookie with hubby, but I gobbled the apple all by my lonesome. 🙂 One of my favorite fall treats. The food was out of this world delicious! I haven’t opened my apple butter yet. Saving it for when I make some homemade biscuits. Would love your recipe. I usually just use bisquick, but yours were out of this world yummy! Oh, and the soup; I can’t forget the soup. Looking forward to you sharing the recipe. Thanks again for inviting us into your home and so happy that I can call you, friend! Thanks for sharing with SYC. I gave you a shout out on my blog today. Thank you once again for coming, Jann. And thanks for the reminder to share the recipes, I’ll get on that and add it to this post. Oh, and thanks for the nice shout out on your blog. And that was your simple table setting?! Is it possible to get any more complex than that??? What lucky friends you have for sharing tea time. I’m still agog. 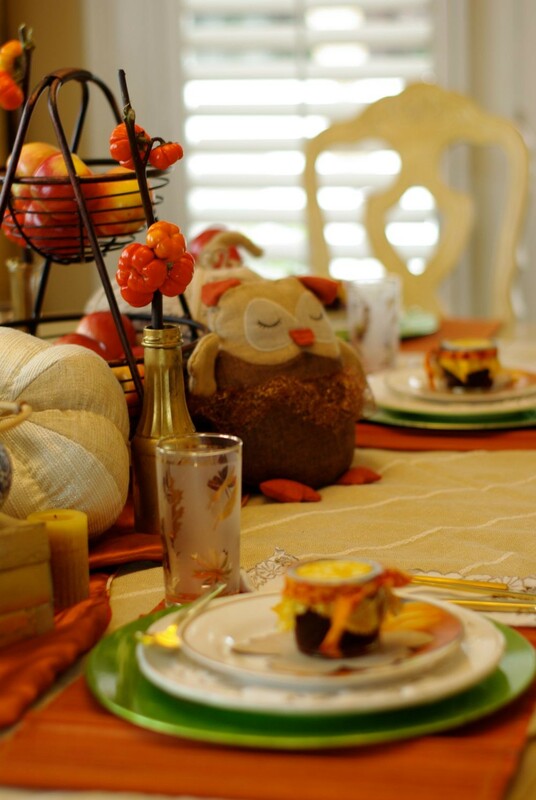 You do such an amazing job of decorating and entertaining, especially since you grew up with a mom that loves to entertain, but as you know I pick up the theme paper plates and those plastic cutlery that look like silver at Costco. When you get my age, friends are so glad to go any place that they don’t have to entertain themselves and can stay as long as they want, sometimes I think just should bring their PJ’s. Of course they are still talking about the wonderful amazing Mother’s Day Tea Party that you invited them to attend 5 years. The fact you put the Grand America Tea Room to shame was a real hit. Keep up the good work my sweet daughter, your grandmother would be very proud of you, she would have you doing all of her bridge parties. 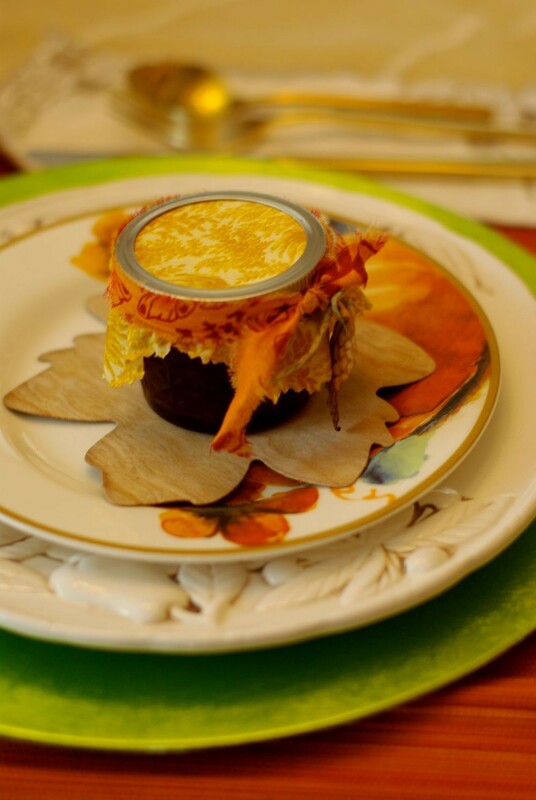 I promise to get out my best fall dishes for Sunday dinner this week, only because it is your birthday.